It occurred to me the other day that Tara and I do not share the same tastes in decorating. “I’ve got a great idea for the bedroom!” she said. She pulled up her Pinterest account and started thumbing through pages of ideas she is collecting for our future home. There are vases and kitchen islands and artwork and French doors. She was particularly excited about a crafts project involving canvas, paint, and leaves that would be mounted collage-style above the bed. Her excitement was contagious. “I’ve got a Pinterest page for home ideas, too!” I said, beaming. When I shared my lone decorating idea with her, the one item I thought would be a great centerpiece for the master bedroom in our next house, I watched her face fall before my eyes. The look in her eyes convinced me that it wasn’t my choice of toppings that turned her off so much as the pizza bedspread itself. I tried to convince her how cozy it would be to cuddle up beneath mozzarella sheets, to rest our heads on pillowy piles of crust, but she was having none of it. And just like that, another great decorating idea of mine was shot down. I still mourn the awesome dogs playing poker tapestry that she talked me out of buying a few years ago. In retrospect it should have been obvious, this incompatibility in the decorating department, given how quickly my shower curtain came down and hers went up once we moved in together. Come to think of it, my bath towels were replaced pretty quickly, too. And when we moved to the apartment last year, the living room drapes inexplicably remained in the townhouse. “We have no room” is a pretty flimsy excuse, given the fact that the 3′ tall garish plastic trophy from her car racing days managed to find a spot in our garage. At least she likes my lava lamps. Ummmm….I’m sorry but even I, a Fake Food Enthuiast, have to take Tara’s side on this one. It does look delicious though. To me, it evokes comfort and warmth. I mean, it’s a hot pizza fresh from the oven! Who wouldn’t want to cuddle up beneath that on a cold winter’s day? Finally, validation. And from a foodie, too! Yeah, but if you brought it to the beach you’d probably attract a million seagulls. I wouldnt want it in my house, but my gosh, it looks DELICIOUS! I put up with huge steer horns in our first apartment together. They are now in his basement workshop. Good point. It could always be worse. At least I’m not into taxidermy! Hilarious! Although I could not have that bedspread…. I’m pretty sure I would try to eat it. I want that bedspread! …to be a real pizza. Midnight snacking would become a constant in my life if that mozzarella was on my bed. 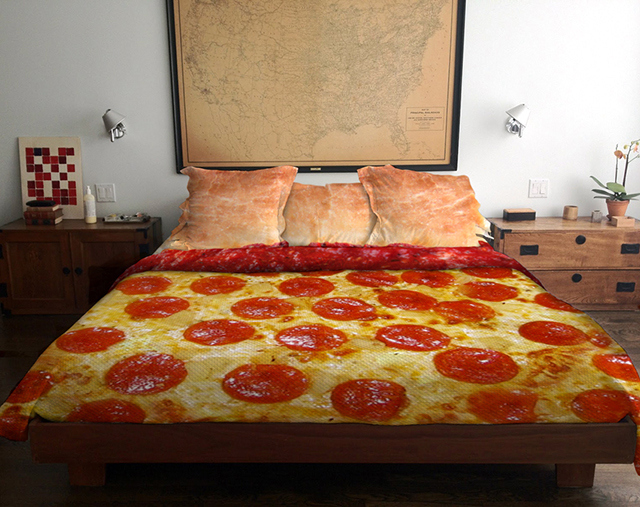 I wouldn’t be able to sleep without eating a pizza first. Okay, I’m going to go order a pizza now, because clearly I’m obsessed. Lol! I think that might be one of the things my bf loves about me. I am not typical when it comes to decorating. I love conversation pieces and things that make you laugh. My dream bathroom one day is a Psycho shower curtain with those bath mats that turn red like blood when you step on it, towels that have red bloody hand prints and a fake hole in the wall to look like you are getting watched. Sounds pretty awesome doesn’t it? It would be better if it was a bacon bedspread!